ENERCAP assists companies and countries to develop Low Carbon Projects through it’s innovative carbon strategy. ENERCAP believes in an EcoProfitable™ approach; good for People, good for Economy, good for Environment. The year 2015 was a crucial time for climate negotiations as the adoption of Paris Agreement at COP21 indicate an important evolution in the global response to the climate change threat. We are then in a position to help and assist our clients in reducing their GHG emissions. We performed more than 10 carbon footprint based on the Bilan Carbone™ approach for energy companies. 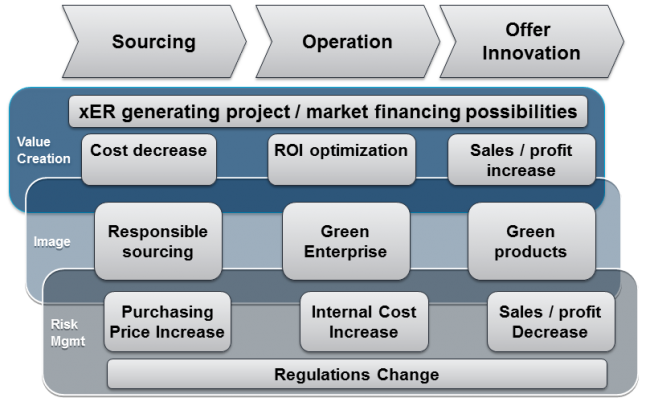 Enercap will review your sourcing activity and assess the carbon stakes. Through reduction of cost, return on investment increases, and an overall improvement in sales number Enercap serves to create and increase the value of your business. Throughout this process, Enercap will also work towards maximizing your carbon credit potential – further increasing that value. Using our previous knowledge and our skilled team of experts, Enercap can perform necessary cost analyses to determine where money, resources, time, and more can be saved. Through proper analysis, both variable and fixed operational costs can be reduced to increase performance and profit. Almost as important as business value is public image. Enercap’s unique approach involves focusing on responsible sourcing, green production and green products as means to promote a healthy and responsible image. Expanding beyond performance analyses, Enercap also provides a comprehensive study of your offers and in what ways they can be altered to improve productivity, output, and profit. All of these relate to the same universal goal: reducing carbon footprint. Without proper risk management, any step of the production process can quickly become a negative impact on your business. Source prices and internal costs can increase, and sales can decrease. Enercap monitor’s these aspects of your business and acts preemptively to avoid these risks before they occur.